People often ask me about the glamor and glitz of the road, working for rock stars, the champagne, the private jets, the beautiful women throwing themselves at us because we’re so cool. Here’s a more likely scenario: spend 16 hours at a dusty bull ring with no bathrooms that have toilet seats and no hot water, climb onto a bus with 15 other people without showering and travel for 12 hours to arrive for a day off just before the sun sets, often with all food and stores closed within 1000 miles. Well, the first part was the last two days and I didn’t have to endure the food and stores part this time. We arrived in Bilbao, Spain yesterday around 4pm, checked in, showered and went directly to The Guggenheim Museum here that Frank Gehry designed. I’ve wanted to come here for 10 years, since it was opened, but most American acts never make it to this part of the Basque region (unless you’re the Chili Peppers). 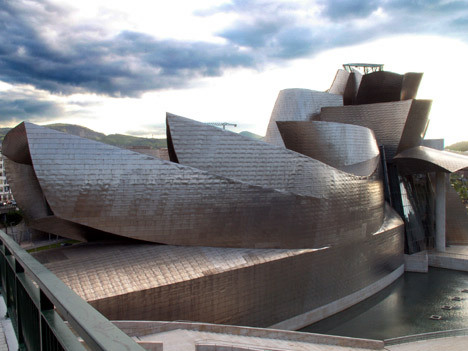 To me the building is the main attraction, the famous shining silver exterior peeling this way and that, an insane metal flower blooming in the midst of a Spanish city, drinking up the water of the Nervion River and producing art. The first of the surprises was the installation by Jenny Holzer of LED’s streaming words in Basque, Spanish and English of an intimate poem. The rhythm and touch of the words made it quite special. The current exhibitions did not really do it for me but I have always wanted to see Richard Serra’s “The Matter of Time“. At 12,000 tons and 430 feet in length, it is an overwhelming piece of art that is at the same time made me feel playful and childlike. Then again, I like rusty metal. If you are ever in the north of Spain, you must stop in and see it. My back hurts just looking at it… my fingers too. 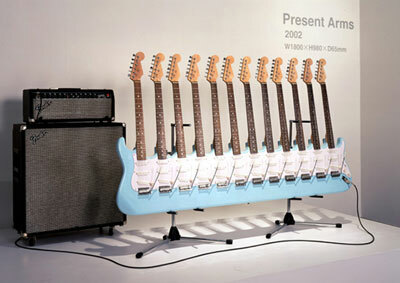 When is it all going to stop?� 2 necks, 3 necks, 5 necks… somebody is going to poke an eye out. Probably me. New Zealand based Chris Booth’s sculptures made from rocks, wood and natural objects… [via] – Link.